Gosh, need some help getting that sword outta ya back? This is why you dont go after a shape shifter. but hey, maybe next time he’ll stab you somewhere that you can pull the sword/knife out of….!! Yes! Though I’m sure Coal would prefer not getting stabbed at all, really. Well at least he looks more annoyed than worried, that’s always a good sign. Well, besides putting a hole in his pretty clothes. Love the comic by the way! Very refreshing art style (feels reminiscent of Zelda: The Wind Waker), and I like the lighthearted take on mythology. Hahaha! You hit the nail on the head Roe. And I’m glad you like the comic! Thanks so much! Haha, only Loki would stab someone in the back as a friendly jest. Love it. 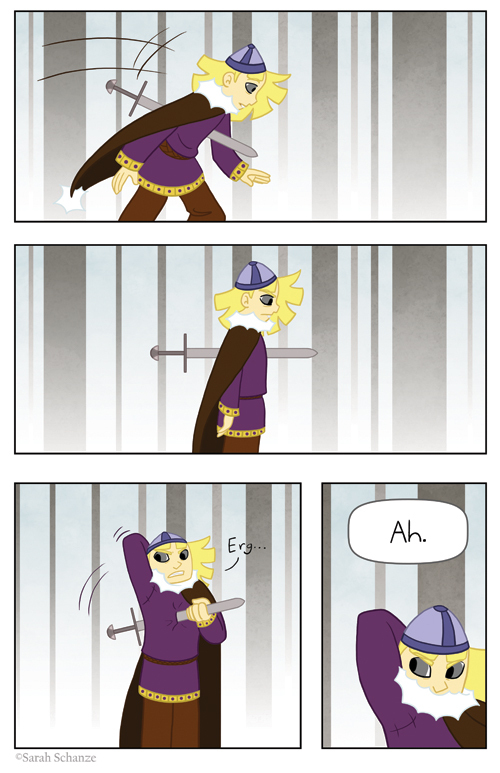 But… stabbing is always funny! I know Coal is ticked off about being stabbed in the back ,but there are worse places on the body for a sword to be shoved into! He could just lean against a tree and push it back out. Can’t really claim the idea as mine. Just reversed it. From ‘The Belgariad’ series by the Edding’s. At one point one of the main characters was all in a funk over his ‘curse’ and was threatening suicide so Polgara used reverse psych on him and suggested he get it over with and told the ships crew to ‘clear a path’ so he could get a good run at the mast. She also chided him for not making preparation for his disposal, so inconsiderate to friends, and that finding dry wood to burn him in a swamp would be a pain and he would likely just smolder for a week. Her sarcasm could be quite biting.